Want to find your first tweet on Twitter? Use Topsy and you can find all your older tweets including your first tweet. Topsy has indexed all tweets of every Twitter account and now its advanced search database can not only display tweets of any account, but also provides very valuable social analytics. If you started on Twitter a long time ago, probably you don’t even remember your first tweet, but I am sure you want to know what it is. 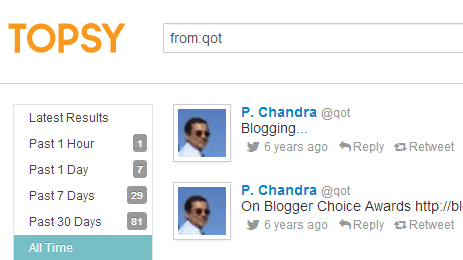 I did not remember my first tweet, but found my first tweet on Twitter made more than 6 years back, via Topsy. What to search – We used from:qot in the Topsy search box to search for our Twitter @qot account. Replace qot with your Twitter ID. Sort by Oldest – this will give you your oldest tweets. By default tweets are sorted by relevance otherwise. Sort by All time – this will allow Topsy to search the oldest tweets goinf back to 2006! By default only last 7 days are selected. Post the link to your first tweet in the comments.